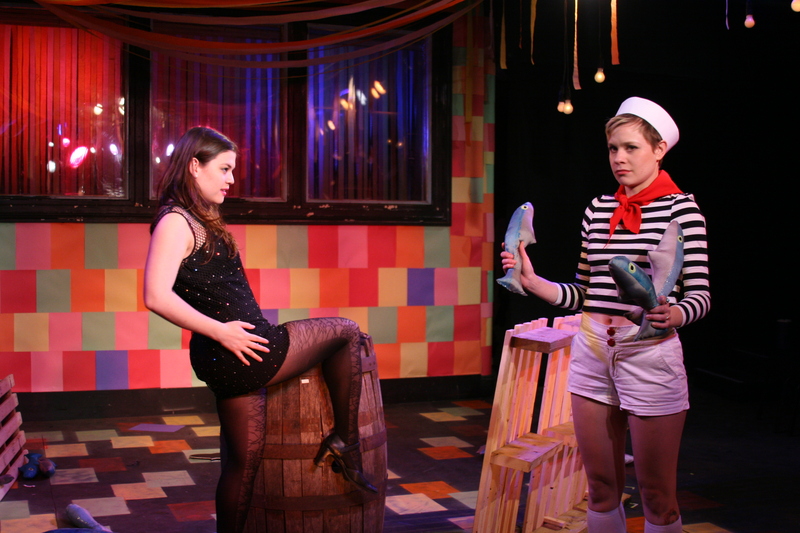 Dana Kreitz as Olivia and Merci Lyons-Cox as Oliver in Curio Theatre Company’s GENDER COMEDY. Photo by Claire Horvath. As students of the arts, we’ve been instructed all our lives to kneel at the altar of William Shakespeare. And rightly so: whatever your personal opinion of the immortal bard, it is inarguable that his work has left an imprint on Western culture that remains as prominent as ever even four centuries after his death. He crafted intricate stories and hung masterful language upon otherwise mundane scenarios. Kids from warring families fall in love; warriors kill for power; a prince seeks revenge. It is all very simple and beautiful. But our undying reverence for Shakespeare can sometimes blind us to those moments in his work when the suspension of our disbelief is a bridge too far. Who, in real life, falls in love at first sight? Who waxes philosophical to nobody in their spare time? Who seriously believes that the high-pitched, clean-shaven messenger boy who shows up minus an Adam’s apple is really a boy? If we’re being honest with ourselves, we might admit that Shakespeare’s plot contrivances are often pretty stupid. Harry Slack—the author of GENDER COMEDY: A LESS STUPID TWELFTH NIGHT GAY FANTASIA—has cut the gaping holes in Shakespeare’s logic into microscope slides, and the result is a hilarious and self-aware send-up of the rarely-discussed flaws in the work of our most beloved playwright. Slack invites us to examine the plot of Twelfth Night in a vacuum, divorced of its flowery pentameter and its historical context. In so doing, we find that Shakespeare’s farce asks its audiences to believe some unbelievable nonsense in the service of the plot. Lavinia Loveless, Dana Kreitz, Harry Slack, and Patrick Lamborn in GENDER COMEDY. Photo by Claire Horvath. And it’s not just loving parody that drives the performance. GENDER COMEDY’s strength is in its unrelenting goofiness. By refusing to take anything too seriously and simply having fun with each other, Curio’s actors have achieved the best kind of parody: one in which a knowledge of the source material is not a prerequisite for enjoying the play. Needless to say, a familiarity with Twelfth Night and Shakespeare in general is helpful for some of the jokes to land, but it’s not mandatory. Slack himself plays Toby Fart, a distilled (ha) version of Twelfth Night’s lovable drunkard Sir Toby Belch. “Toby Fart” is a funny name on its own, and Slack happens to be a talented comedian. But the change from “Belch” to “Fart” is important. For all his genius and human insight, Shakespeare’s jokes were often of the durrr variety. Slack his fellow clowns delight in that stupidity, and their zealous glee is infectious. 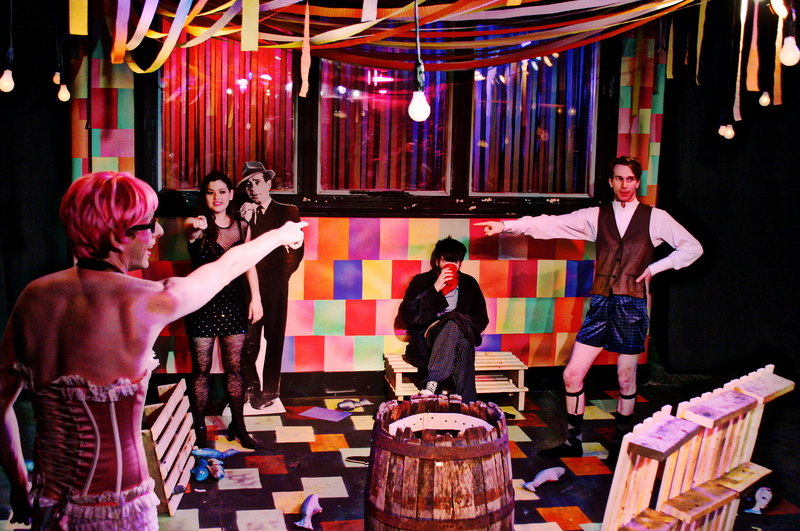 It’s fitting that GENDER COMEDY’s run coincides with Pig Iron’s remount of Twelfth Night over at FringeArts (Phindie review). Shakespeare’s comedy, for all its flaws, remains hilarious, and we are reminded of its wit and charm anytime it comes to town. But Curio’s production proves that it’s also rewarding to strip our revered masterpieces down to their brick and mortar, to stick Shakespeare in a blender and gawk at the goopy mess that lies beneath the polished surface of his legacy. We need cultural icons, but we must also be able to laugh at them. GENDER COMEDY shows us that sometimes the most appropriate way to honor our heroes is to hack them mercilessly to bits, laughing all the way. December 5, 2013-January 4, 2014, curiotheatre.org. Michael Fisher is an actor, playwright, and musician. He is currently pursuing an MFA in Creative Writing at Rosemont College. He lives in New Jersey. Follow his tweets at @m_roy_fisher.